In 2014, the Hinesburg Selectboard struck a secret deal with Vermont Gas that's now blowing up in its face. Just last month, residents learned of an agreement that spells out conditions for allowing the utility to route its controversial pipeline through a town park. Within days, Hinesburgers launched several last-minute attempts to stop it. One group has hired preeminent anti-pipeline litigator Jim Dumont of Bristol, who intends to argue that Vermont Gas cannot legally seize the land. Some are worried about the flora and fauna in Geprags Community Park — in particular, a rare golden-winged warbler that nests there. Others say the selectboard's agreement violates the will of two sisters who gave Hinesburg their land on the condition that it be used for public recreation or education. There are questions, too, about the validity of the agreement, which was drawn up behind closed doors. The Public Service Board signed off on Vermont Gas' plan to build a 41-mile natural gas pipeline from Colchester to Middlebury in 2013. That it was routed through Hinesburg's Geprags Community Park has been clear since early on. 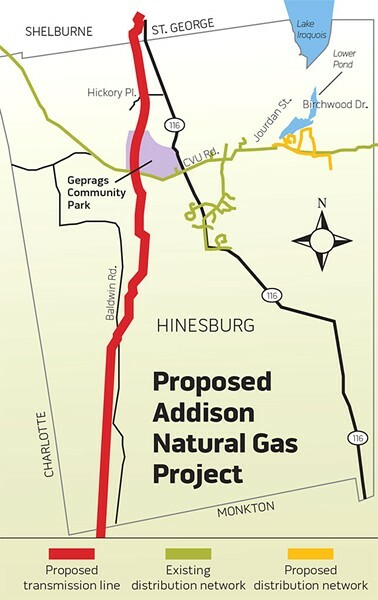 What Hinesburg residents didn't know, up until a few weeks ago, was that the selectboard had drawn up an agreement with Vermont Gas back in August 2014. Because of the restrictions on the roughly 80 acres of forest and former farmland, both parties concluded that Vermont Gas would need to use eminent domain to run the pipe through the park. The town said it wouldn't stand in the way. Instead, it drafted a list of conditions with Vermont Gas that would come into play if and when the Public Service Board approved the required easement. According to that document, the town would give the company a permanent, 50-foot-wide right of way along the roughly 2,000-foot stretch of pipeline. Vermont Gas, in turn, agreed to deliver natural gas to two trailer parks on Richmond Road and pay the town $75,000. The utility also pledged to work around the warblers' breeding schedule and to plant bird-friendly shrubs after construction. Additionally, it committed to work with the town conservation commission to address any other concerns that might arise. Two miles of trails traverse the park, which is also a popular dog walking spot. Vermont Gas still hadn't initiated the eminent domain hearing when residents, including selectboard member Andrea Morgante, noticed backhoes north of town earlier this winter — a clear sign that the pipeline was approaching. On February 11, the Public Service Board held a preliminary hearing on Geprags. Morgante found out about it in time to attend. So did Hinesburg resident Rachel Smolker, who got tipped off from friends at the climate-action group 350.org. At the hearing, both women were surprised to find that Vermont Gas was trying to speed up the legal process. The utility asked the PSB whether the preliminary hearing could double as the final one. The PSB denied the request. Four days later, Smolker and several dozen others showed up at a Hinesburg Selectboard meeting, demanding an explanation. The elected officials said that they, too, were surprised by news of the PSB hearing. "They haven't been great communicators with us, either," then-member Jonathan Trefry said of Vermont Gas. He didn't run for reelection in March. "I personally think it was very intentional," Morgante said, suggesting that Vermont Gas kept the town in the dark about the eminent domain process to avoid the kind of controversy it now faces. She called on the board to keep closer tabs on the company, warning, "Unless we are vigilant, things will happen that we will regret." Residents at the selectboard meeting wanted to know why they didn't know about the deal sooner. The board appeared ill-equipped to answer. Member Phil Pouech said he and fellow selectboard members might have been mistaken in keeping the agreement from the public for so long: "We were under the assumption, I think, up until just a couple days ago, that this was not an open document. Maybe we were wrong." People who serve on town committees are also upset. "The information flow is terrible here," Chuck Reiss said at the February 15 meeting. Reiss is chair of the town's energy committee, which passed a resolution on February 17 opposing the pipeline. He was also on the conservation commission when the town inherited the land from Dora and Helen Geprags, two elderly sisters who died several years apart. 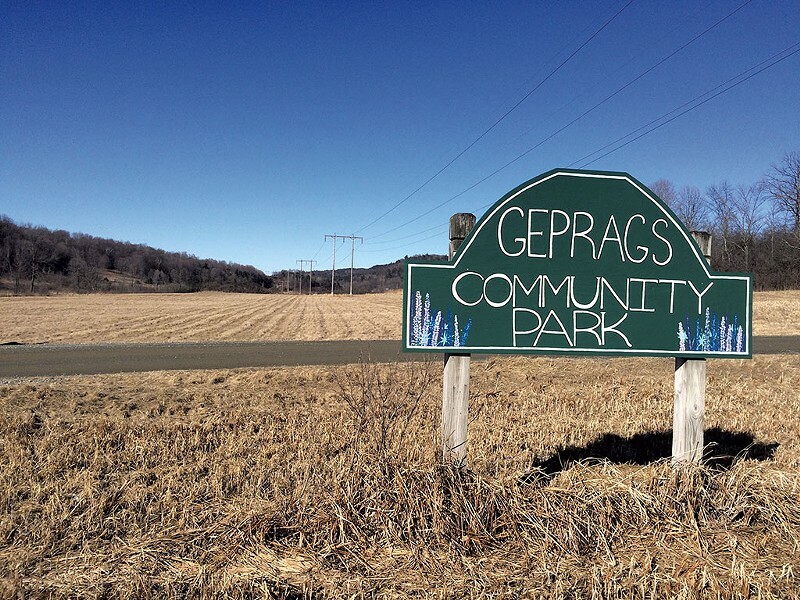 "As a citizen, I feel like the Geprags sisters are not being honored," he said in a later interview. "I really have a problem with that." Conservation commission chair Alison Lesure told the board: "We haven't been involved the way we should have been." Lesure's commission, which manages the park, sent a letter the following day outlining its concerns: "The agreement is extremely short on detail; the corridor plans have no contours, there is no discussion of length of time for construction, construction methods, wetland restoration, soil compaction mitigation or protection of the rare plant community." At the February 15 meeting, the selectboard told residents they had until February 17 to file a motion to intervene with the Public Service Board. Residents managed to get a short extension from the PSB. Still, Reiss said, "The ability of the townspeople to get involved was truncated into a week's time. That's insane." Insane or not, three separate motions to intervene have since been filed with the PSB — one by the conservation commission; another by William Marks, who serves on that commission; and a third by residents Nancy Baker, Linda Gage and Smolker. Dumont, who represents the last group, plans to argue that eminent domain can't be used to obtain an easement in a public park. The key legal precedent: a 1928 Vermont Supreme Court decision in which the justices rejected the Central Power Corporation of Vermont's request for an easement on land owned by Middlebury College. The court ruled that the bequeathed land, which was already dedicated to a public use, couldn't be seized for a different public use. Residents are still waiting to hear whether the PSB will grant them "intervener" status, allowing them to participate in the hearings as "formal parties." In the meantime, they're pursuing another course of action. Last Wednesday, Dumont's clients, joined by several other residents, including Reiss and Marks, lodged a complaint with the selectboard, accusing it of violating the state's open meeting law. The selectboard doesn't deny that "in principle" it reached an agreement for the easement while in executive session. Although no members signed it at the time, lawyers for both sides did so later, in April 2015. Residents allege that the board didn't follow proper procedures during executive sessions. During an interview, Dumont suggested that the only justification for discussing the agreement behind closed doors would have been to avoid putting the town at a disadvantage during negotiations with Vermont Gas. Once the terms had been settled with the company, however, there was no reason to keep it from the public, he said. The Bristol lawyer also thinks that the board illegally made either a formal or an informal decision to accept the agreement in secret. Vermont's open meeting law requires that such decisions happen in public. Dumont's clients are asking for more than a mea culpa: They want the selectboard to nullify the agreement. On Monday — after discussing the complaint in executive session — the board admitted that it may have unintentionally violated the open meeting law. It decided to hold a public meeting about the agreement on March 21, during which members will vote on whether to ratify or repeal it. But members noted that annulling their deal wouldn't necessarily stop Vermont Gas from seizing the land. That's ultimately up to the Public Service Board. Last fall, the PSB considered revisiting its decision to approve the pipeline. Since Vermont Gas won approval in 2013, the estimated project cost has ballooned from $87 million to $154 million. But in January, the PSB determined that the pipeline was still in the public's best interest. That same month, Vermont Gas announced it had reached easement agreements with 161 of the 164 landowners along the proposed route. Dumont represents two of the remaining property owners. 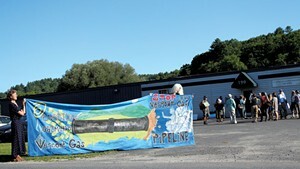 Despite ongoing protests against it, Vermont Gas plans to complete the pipeline in 2016. It's not yet clear whether a few Hinesburgers will get in the way of that goal. 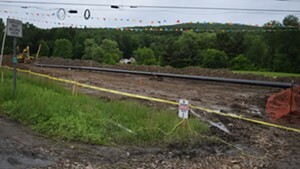 In an email, Vermont Gas spokesperson Beth Parent said, "We are hopeful that the interventions will not delay construction or service to these potential new customers or to the thousands of Vermonters on the pipeline route who are depending on us to deliver our services." Parent said the company will work around properties where it does not yet have easements. In Hinesburg, it will also need to accommodate the golden-winged warbler. Its nesting season starts in April and can last through July. Last week at Geprags, backhoes pawed the ground right across the road.